What Does Two for One Mean? So you may have run across this site because you are looking for a good deal. Generally, that is what 2 for 1 indicates, but not here. Here it refers to my weight, divided by 2. 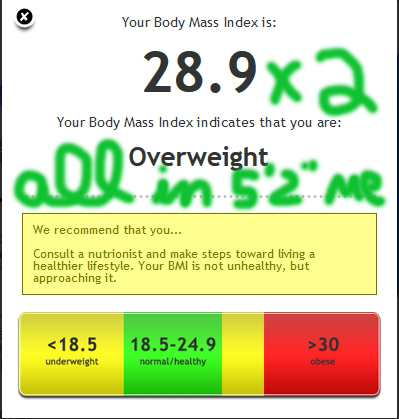 I literally weigh more than two people of healthy BMI. As a matter of fact, I am on the border of being 2 “obese” people in one body. I am actually 2 “overweight” people, and I want to change that. THIS IS MY JOURNEY. It is going to be a very honest and transparent journey. Maybe you’re on a similar journey, hey, let’s travel this lonely road together then. I encourage your comments. If you have a similar blog, include your address, and I will share it with my readers as well. Author Margie FullerPosted on April 22, 2013 April 3, 2018 Categories General, JournalTags 241, BMI, body mass index, changing my behavior, changing my life, chunky, fat, fat girl, fatty, fighting for my life, Health, losing weight, mobidly obese, obese, Obesity, over 150 pounds to lose, over 300 pounds, overweight, two for one, Weight loss1 Comment on What Does Two for One Mean?